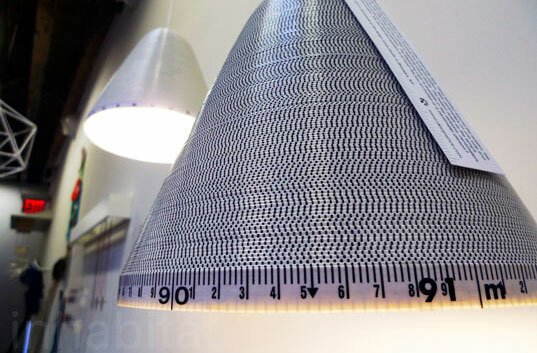 This week the Inhabitat editors checked out the Model Citizens and one of our favorite finds was this cleverly constructed measuring tape lamp that comes in both metric and standard measurements. Hardly the sort of lighting choice you’d find at grandma’s sewing station, Measuring Light is made from coiled measuring tape and transforms the ticks of a functional tool into an eye catching modern design with a compelling graphic pattern. A product of the Brooklyn-based studio Design Since, each pendant lamp is handmade using a spool holder and a large electric-powered bobbin winder (think giant sewing machine). The bobbin which tops off the lamp functions as both a structural element and a source of ventilation, and continues the aesthetic from which it’s inspired. Spun from spools of either centimeters or inches, these beautiful lamps are able to communicate a contrasting set of values — practical, visual and otherwise. Futuristic and functional. I want one in my home!